There are two types of minerals: Macro minerals and Trace minerals. Macro means "large" in Greek are dietary minerals needed by the human body in high quantities. The macro mineral group is made up of Calcium, Phosphorus, Magnesium, Sodium, Potassium, Chloride, and Sulfur. An organic compound contains carbon. 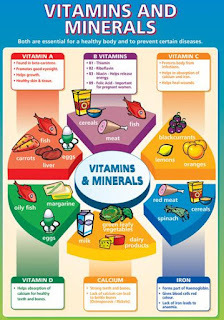 When an organism (living thing) cannot produce enough of an organic chemical compound that it needs in tiny amounts, and has to get it from food, it is called a vitamin. There are 13 vitamins your body needs. You can usually get all your vitamins from the foods you eat.